And how Atlassian actually does it! If you missed out on attending the webinar in person, fear not because we have the recording for you to check out! This webinar is a truly great opportunity to learn from one of the leading software trainers in the field, Altassian’s Global Training Manager, Robert Bleeker. You will be privy to valuable information that you won’t be able to find anywhere else online. If you’re looking for a little more info before you decide to invest your time. Here’s a short summary. Learndot’s Dilyana Hadjeva, Product Marketing Manager, and Jesse Miller, General Manager, kicked off the webinar with a review of challenges of training today’s distracted learners with short attention spans and sharp forgetting curves. Our very own Muly Gottlieb, CTO at CloudShare, introduced the audience to the concept of virtual training labs and then grounded it by showing the experiences for different types of users, including the students, instructors and the Admin/IT and management. Muly capped off his part by summarizing the 4 proven reasons why software companies must implement virtual training labs, as promised in the invitation. 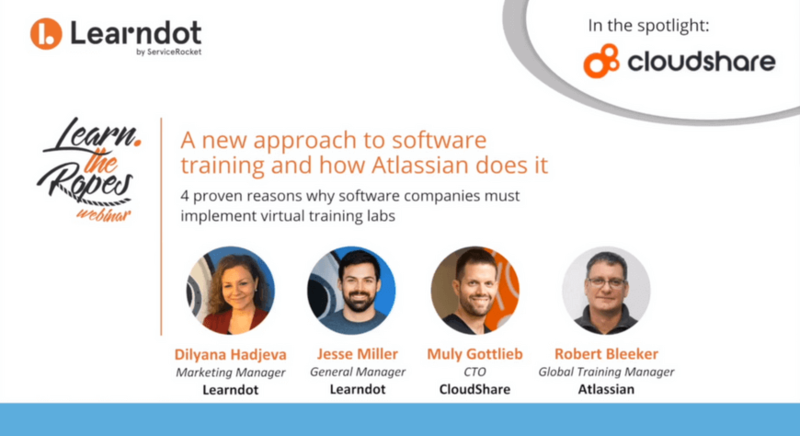 However, all this was a segue to the real star of the event, Altassian’s Global Training Manager, Robert Bleeker, who generously described the model he has used to initiate and grow Atlassian’s training program from scratch to the success of today (company revenues of $619.9 million July 2017). This is all based on the firm belief in the benefits of hands-on training. Step 1 – Start by creating a “case study” that contains all of the skills and end goals you want your end users to reach. Step 2 – Reverse-engineer the case study. Develop your courses by breaking down the process into steps and building the modules and documenting lab workbooks. Step 3 – Develop comprehensive student guides and deploy to students. I can assure you that this webinar contains information that training managers can immediately apply to their jobs. And your colleagues seem to agree, as 95% of the audience remained on the call until the end. I invite you to listen to the webinar here. I’m sure it will be worth your time.